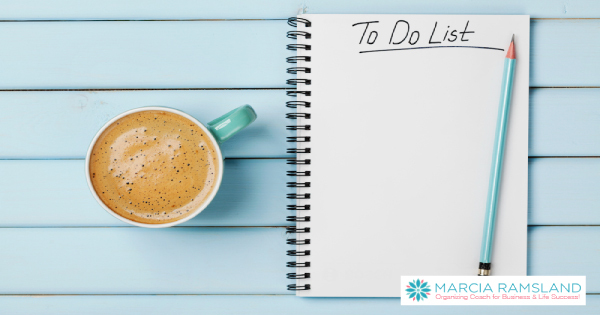 Do You Get Everything Done on Your To Do List in a Day? Put simply, a To-Do list is a list of actions you want to remember or need to accomplish in a given day or short time period. It solves the problem of “I forgot …” and relieves the worry that you won’t remember a need that comes up during the day. My friend Liz once said, “My mind is like a computer, and I’ve run out of RAM (memory space). And like a computer, I think my brain is about to crash.” I heard recently that our short-term memory can only hold seven items before it starts pushing things out. That’s why we forget details that we intended to handle. One way to manage our time is to control the way events occur, preferably by planning what’s coming instead of losing time over forgotten tasks. 1) Limit it. Feel out how many items you can handle in a day. When my kids were in school, I did nine items; but when they were home, I could only do three. Find the number that works for you. 2) Write it. Each day, write down what you need to accomplish. Clear out mental clutter by putting it on paper. Leave a space between each item to sandwich in higher priorities. 3) Verb-alize it. Begin each to-do item with an action verb (e.g., pay bills, call Mary, send a birthday card, put away laundry, outline proposal, etc.). Your mind visualizes you in action as you “verb-alize” it and then write it down. 4) Post it. Keep your to-do list in the same place each day. Whether it’s in your planner, on your kitchen counter or on a sticky note on your computer monitor, keep it anchored in one spot. 5) Refer to it. Refer to your list throughout the day until you are finished. Consider it your personal compass pointing you in the right direction. 6) Adjust it. Plan your morning to-dos the night before. Before lunch each day, plan your afternoon list. 7) Check it off. As you complete each item, check it off with a red pen, cross it off or delete it from your computer list. 8) Practice it. It takes practice to create a list that works one day at a time. Avoid making this a long-term project list. Keep it short and use it to focus on daily tasks only. 9) Evaluate it. At the end of every day, see what worked and what didn’t. This will help you avoid making the same mistake twice. 10) Toss it! When the list is complete, toss it! Enjoy two great results: emotional relief and a clear mind. *Excerpted and condensed from Marcia Ramsland’s book, Simplify Your Time: Stop Running & Start Living! For my list of Planner Products which I recommend including pages with a To Do List format and which I teach in my “Time Management Just for Women” Coaching, check out my personal favorite Planning Products HERE. Yes, I liked the refresher on the things to do list. I keep a things to do list on which I try to group activities that are similar (like phone calls or searching on the internet or e-mail or pay bills), but I also find grouping activities according to around a location I need to go to (like market square) very helpful. I like to plan for a day where I have a mixture of activities and try to add enjoyable activities whenever I can like ones I can find at the library to look forward to each day (from a file or flyer or notices) I keep is a great pick me up.